So I have a few posts about upgrading a classic frame with more modern components. I have a couple of lingering questions about modern components. 1. I am a bit of a clyde with some knee issues, so I want some easy gearing. With modern cranks, I could go triple or compact double. I am not worried about the weight, but are there advantages to one over the other? Seems with a triple I can have a true granny gear, like on my mountain bike. 2. I have never used brifters. I could to with brifters or index bar end shifters. This might be more preference, but are there advantages to going one way or the other? I still wonder whether it is worth it to upgrade, or just buy a new bike. There is a bike with 105 at REI on sale now for $1,100 or a Salsa Marikesh, Surly Long Haul Trucker, Trek 520, etc. What is your opinion/recomendation? I assume this is mainly personal preference as well, but wanted some input. Double or triple is a lot about race aesthetics. No one races on a triple. And a little about not dragging along gear you don’t use. There’s plenty of riding that doesn’t need a triple. Still, my commuter has a triple. It only gets used in winter conditions. Snow, studded tires and climbs. But I can’t say I’ve ever felt that the presence of the triple has ever prevented med from doing one or the other. If i ever get around to setting up a dedicated summer commuter it might not have a triple. Depends on if I end up buying stuff for it or if I use something I already have. If you think you’ll need one, get one. I prefer brifters. Years of MTB exposure has spoiled me completely WRT having shifting at fingertip distance. Bar ends often have a friction setting, making them very tolerant If you’re forced to replace a rear wheel kinda sudden. Triples can be touchy to set up on STI shifting. Bar ends have friction up front which eliminates the problems. Compact gearing can be very attractive but if you need a granny then triple is the way to go. myself other than my touring and drop bar MTB, most everything has a compact double. I do have one race bike with a traditional double for go fast, flat terrain riding. as far as making upgrades worth it, for me it depends on the fit, love of the bike, and getting a deal on used parts. Once I find a donor bike the upgrade begins! If you don’t have to have the very latest and greatest, you can upgrade on the cheap with people dumping 8 and 9 speed stuff. Upgrading to a high end version of either of those can be done for very little. Do you really need 10 or 11 speeds? Let people that have to have the latest/greatest subsidize your upgrade. They dump their 8 or 9 speed stuff and you snap it up. Sometimes you can find a donor where the frame alone will cover the entire price! Nothing like a free upgrade! Last edited by wrk101; 05-27-18 at 11:27 AM. Go with the compact or sub compact. The hassles of dealing with setting up a triple are not worth it for the little return a closer gear ratio gives back. I am running a 50/34-11/28 on one bike and a 52/36-11/30 on another bike. They both work just as well as the 52/39/30-11/27 I have on a climbing bike I built before compacts came out. I did like the 48-45-34/13-15-17-19-21-24 triple setup I put on the Peugeot PKN-10 before I gave it to my son, who gradually had me change it to 52-45-34/13-15-17-19-21-23-26. When I was limited to 5 cogs in back, I converted most of my bikes to triples, either as described above or in a third-step format, such as 48-45-42/13-16-19-23-26. With 6 or 7 cogs in back, I find less urgency, but then I do not carry a gear higher than 96 inches (46/13 or 50/14) on my road bikes. Modern road triples like 4700 Tiagra 10 speed all have proprietary inner rings so one is often limited to a 30T ring anyway. If you can track down an older ultegra from the 6600 or before then you can customize the rings a bit more, they are true 130/74bcd cranks so they work alright. If you're going to go 11 speed the sub-compact doubles (46/30) and a wider range cassette can get you pretty close to the same range as a triple but sometimes the spacing might not be up to snuff if you like tight gears and a massive range a triple is good. I've had good luck with the 6700 10x3 shifters and using a 9 speed MTB derailleur to get some really low gearing. I switched up the setup a bit and am now using a 6700 long cage RD with a 12-30 cassette and a 50/39/24 crank and it seems to work well enough but the limit screws have to be in the perfect position and chain length needs to be right-on as well, the XT 9 speed rear derailleur is a better choice it takes up more chain... setting up these out-of-spec drivetrains is quite persnickety. I like the brifters myself and haven't had any trouble with the 3 sets I have, but for more relaxed riding I've never had a problem using bar-end shifters and they do allow for a lot of lee-way with the front shifting and having to trim. I just think that a triple with STI is too finicky. Yes, it can be set up to operate properly, but IME tends to go off-setup due to cable stretch, housing friction, etc. more quickly than one might wish. On the other hand, a friction FD with a triple is pretty much set it and forget it, whether done by down tube or bar end shifter. Or, dare I say it, with Ergo. There are combinations of Ergo and Shimano that work together, but I'm ingnorant about it, being a diehard down tube guy. 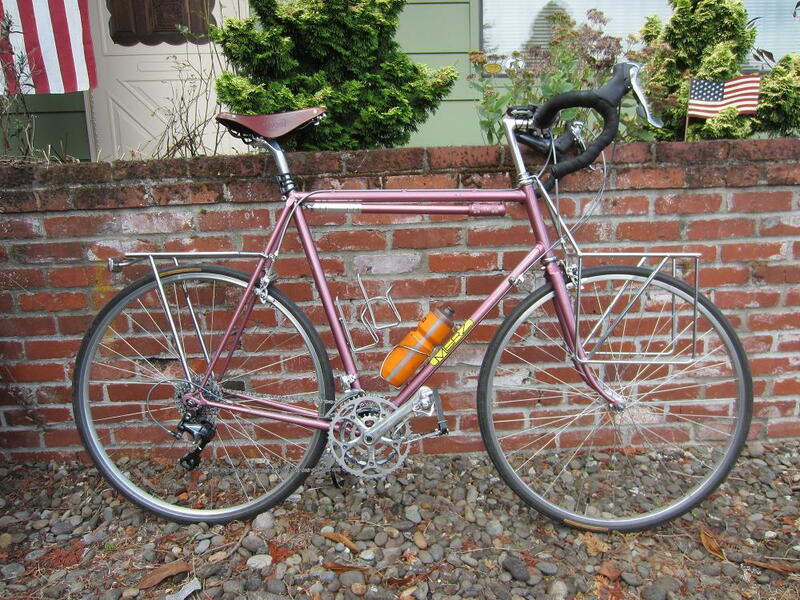 Have found that older Deore RD's and FD's work quite well with 8-9-10 speed road shifters of the downtube and bar end variety, and a 48-36-24 110/74 bcd crank mated to a 12-34 cassette pretty much covers my gearing needs for either touring or steep mountain passes, paved or gravel. For those times when the bike is less loaded and the passes not quite as steep, the same FD/RD combo paired with a 50-34 compact works well and would be very easy to set up with STI's if one were so inclined. Look into a 46/30 adventure crank. FSA has em for less than other options i know of. that, plus an 11/34 cassette, will give you more range. Shifters. Though I've used bar ends, and they're fine, I prefer indexed 9 or 10 so I can go double or triple friction up front and simple, precise and reliable indexed rear with a wide range of options. Gearing. My two compact "modern" bikes (1989 & 2001) are 50/34 front and 11-28 rear both STI and plenty for climbing. My standard "modern" bikes (1985 & 1988) are 53/39 and one is 11-34 (for all-around use) and the other is 11-28. With rccardr 's advice, my triple tourer is 50/34/24 and 11-28, indexed downtube shifters, which we both prefer, 3x10. It only has 135 miles on it. Triples need the chain, FD, crank set, BB, and front shifter to all play nice. Doesn't always occur. If you can go compact double, brifters are fine, and the range is pretty good. You can "expand" that with a larger cassette and an MTB RD. If you need the wide range of a triple, I would refrain from STI, but would consider Campy Ergo. My pick there is a 2/3 x 9/10 downtube setup, without hesitation. Last edited by RobbieTunes; 05-27-18 at 03:50 PM. Thanks for all the advice and suggestions. You know I had not even thought about using downtube shifters, which is all I have ever used, except for the thumb shifters on my mountain bike. I had not thought about a mountain bike rear derailleur either. hmmmmmm, much to think about! Don’t forget that Shimano is not your only option. I run Campy ten speed rear with a triple front, using a 22-30 low gear. (The main issue with Campy for touring is that 30 teeth in the rear is the largest available, at least to my knowledge.) As for the cranks, I use a Sugino on one bike and a Spécialités TA Zephyr on the other. And of course, SRAM makes a great line of components that could easily give you low gears and might not have the same finicky shifting that Shimano has. I love Campy, its pretty much all I have now. 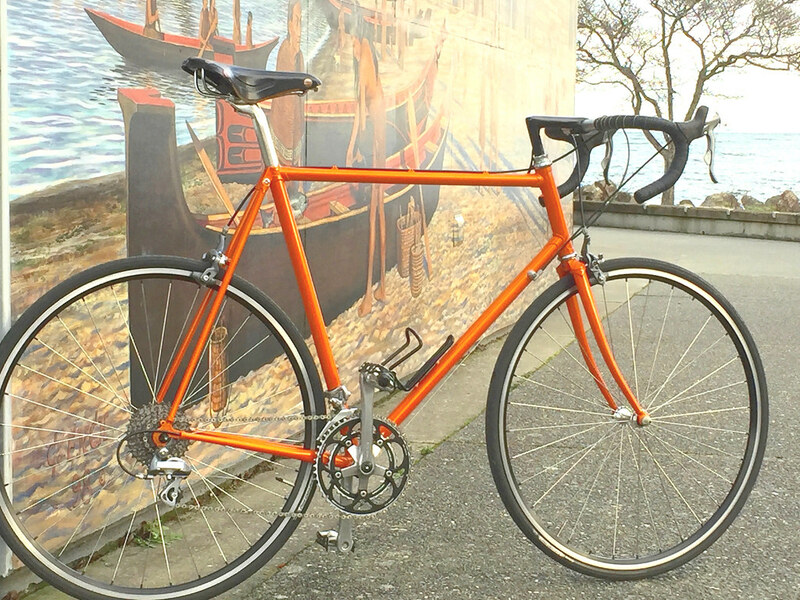 Was looking at some 9-speed Veloce set ups, like on the Masi I linked to. Or as an upgrade to my older bikes. Last edited by crandress; 06-02-18 at 10:02 AM. This setup performs very well, maybe Merz magic from him drilling the crank and installing the 28t granny, but also later upgraded to 9 speed Ultegra by David Feldman who worked with Jim at some point. This was the deal clincher for me when I found this bike, Merz touring, modernized = all good even with the wacky AX crank, works great and is awesome to ride. And it was his, ridden many, many miles by him. Yep, just thinking about pulling the trigger. Where in Central Iowa are you? Just curious. I am in Dubuque. Dubuque? You would enjoy the Dairyland Dare, and the guys that show up for it each year. Just 45 miles up the road in Mineral Point and Dodgeville. Yep, it’s on my list. I may have a travel conflict, but if not, I would likely be doing the 50 or 100k route. Dirty Campagnolo secret, gen 2 ergo power works really well with triples. Gen 1 works also but I like the gen 2 action better. Ratchet up and down FTW. Oh nice I'm in the Ankeny area, love the trails. 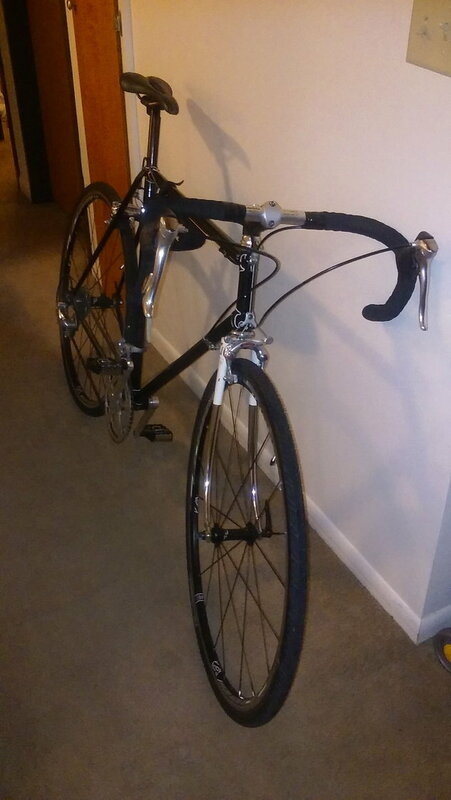 I run a 50x39 now and so the tiagra triple sounded purpose-built and cheap. The crazy winds we get make having a 30t nice to have occasionally. I am a recent convert to the concept of compact doubles. Case in point: It's a mongrel, and it's really pushing the capacity of the RD, but I have a 34/32 bailout on my Trek 400 w/8-speed 600 Ultegra 6400 brifters that'll get me up just about any hill. As you are a former Western Washingtonian, @crandress, I'm sure you know what I'm talking about when I talk about hills. Didn't know you had those in Dubuque. If you want to get real low, though, a modern Sora/Tiagra 3x10 type of thing seems to make sense. It just won't look as pretty. As you are a former Western Washingtonian, @crandress, I'm sure you know what I'm talking about when I talk about hills. Well thay’s what I thought, it’s iowa, right? Very hilly along the Mississippi, where Dubuque is. Even some seattlesque hills on the bluffs in the city. I think there is some pretty good elevation gain on the Dairyland dare and RAGBRAI, ride across Iowa. When I bought my Jamis in 2011, it could be ordered with either triple or double rings. The shop actually talked me out of the triple, even though that's what was on the bike in stock. They swapped the cranks to a compact double from another bike in the shop. They gave the same reasons as the others here. Saved from tip: thoughts on selling?